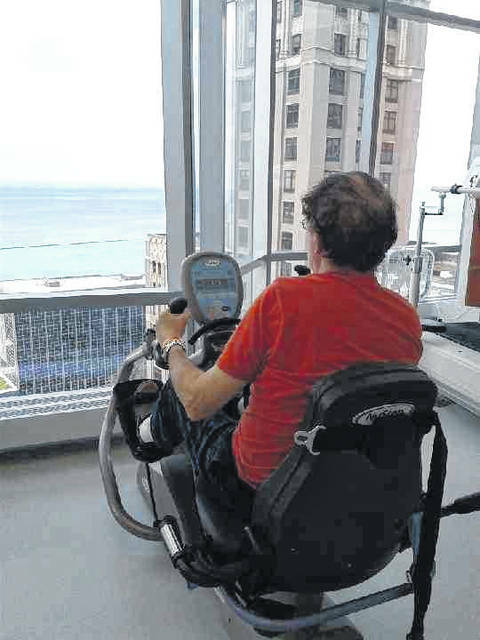 Mike Brown overlooks Lake Michigan as he exercises. Brown discusses his condition and Gallipolis with medical professionals. 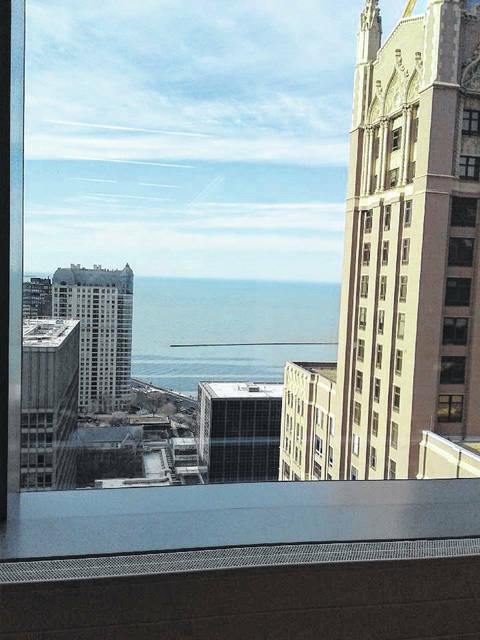 Brown’s view of Lake Michigan. Mike Brown has his leg inspected in a brace with medical professionals. Mike Brown takes some steps with the help of a therapist. 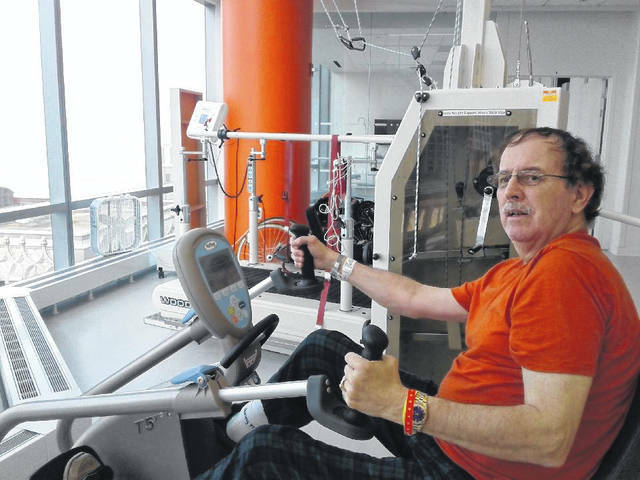 GALLIPOLIS — Gallipolis resident Mike Brown, past city commissioner and area volunteer, after over a year of struggling with a health challenge, says he is determined to walk again. 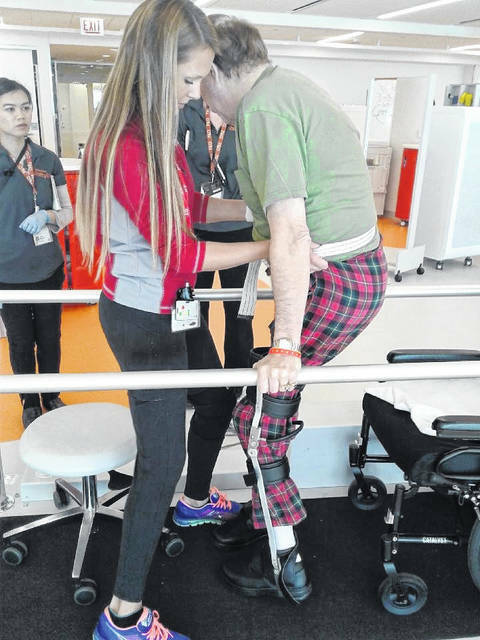 He wishes to spread awareness of what has been called a rare medical condition as he seeks to overcome nerve damage in his attempts to walk unassisted again. Brown said he was getting ready to go out to eat and was preparing to bathe on Feb. 7, 2017, when “it hit me all the sudden.” He had tingling on his left side from his waist down and was on the floor and could not get up. He did not have his phone with him and he said it took him all night to get himself to the bottom of his steps, having been on the second floor, around 6 a.m. before he was able to reach someone for help. “I called him and I said ‘Heath, I think I’ve had a stroke,’” said Brown. Brown lauded Vinton Baptist Pastor Heath Jenkins as a supporter and friend throughout the process of his medical recovery. Doctors identified Brown as having suffered a spinal cord infarcation. According to the National Institute of Neurological Disorders and Stroke’s website, “Spinal cord infarction is a stroke either within the spinal cord or the arteries that supply it. It is caused by arteriosclerosis or a thickening or closing of the major arteries to the spinal cord. Frequently spinal cord infarction is caused by a specific form of arteriosclerosis called atheromatosis, in which a deposit or accumulation of lipid-containing matter forms within the arteries. Symptoms, which generally appear within minutes or a few hours of the infarction, may include intermittent sharp or burning back pain, aching pain down through the legs, weakness in the legs, paralysis, loss of deep tendon reflexes, loss of pain and temperature sensation, and incontinence.” Mike’s stroke occurred through the T-10 through T-3 parts of his vertebrae. Since that time, Brown visited Riverside Methodist Hospital in Columbus for nearly two weeks then he came home and he spent time in rehabilitation with Holzer Health System. before undergoing care at the Shirley Ryan AbilityLab, a research and specialty rehabilitation hospital. Brown said he understood the institute to be the number place for spinal cord injuries in the country for 26 years. Brown underwent heart surgery at one point in his care as he said after the spinal infarction it was common for an “aorta to dissect from a heart” and it needed to be reattached. He returned home from Chicago in May and is still undergoing treatment but fully intends to walk again. Treatment for spinal infarcation can consist of occupational and physical therapy.